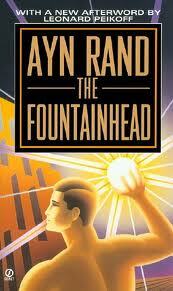 Fountainhead is one of my all time top ten favorite books. The lead character, Howard Roark is an independent-minded architect who bucks conventional wisdom and delivers buildings with vision and verve in the face of criticism and doubt – in short, a true entrepreneur. One of my favorite scenes is when his antagonist, Ellsworthy Toohey, an obsequious newspaper columnist, captures a private one-on-one moment with Roark and asks him: "Mr. Roark, we’re alone here. Why don’t you tell me what you think of me? In any words you wish. No one will hear us." Roark replies, “But I don’t think of you." The sentiment is simply delivered; no antagonism or emotion – Roark truly doesn’t even consider Toohey or other critics like him when embarking on his work. As he embarks on his long-anticipated IPO road show, Groupon’s founder and CEO Andrew Mason will need to channel a bit of Howard Roark. Critics love to throw stones at the company, as they do for other high-flying start-ups. I admit, even I have my doubts about the daily deal model and how sustainable Groupon’s approach will be in the face of merchant and customer attrition over time. This week’s news that smaller daily deal rival, BuyWithMe, is retrenching and laying off half its staff is not a good omen. Yet the best entrepreneurs (and VCs, I suppose) know to ignore the critics and naysayers. In fact, like Howard Roark, they don’t even think of them. They keep their head down and focus on building a great service that their customers love and creating a great culture that engenders loyalty and passion amongst their employees. It all began a few months ago, when Massachusetts Governor Deval Patrick visited Israel on a trade mission. He met with numerous Israeli entrepreneurs to foster greater business partnerships and opportunities with Massachusetts businesses. While there, he met with a few Palestinian entrepreneurs as well and invited them to come to Boston to establish closer relationships with local businesses. Last week, they took him up on this offer – coming to both Boston and Silicon Valley to meet with business leaders from the IT industry. The Boston visit was coordinated by the Progressive Business Leaders Network, a business organization I co-founded, and Governor Patrick came to meet with the group to welcome them to Boston. I was blown away by the group of Palestinian entrepreneurs – they had more in common with entrepreneurs in Boston, Silicon Valley and NYC than probably many of their own people. They could have stepped right out of Techstars central casting – smart, scrappy, ambitious, hungry. 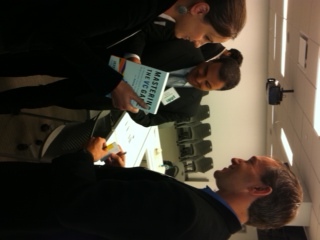 I enjoyed hearing their stories of their entrepreneurial journeys to create their companies. (I joked with some chagrin with the one female in the delegation – pictured above – that their male : female entrepreneurial ratio matched our own). Traveling with the delegation was a USAID executive who is assigned to the region to foster more business development with entrepreneurial companies. I was able to enlist a Palestinian Harvard Business School student (we hosted the event at Harvard’s new Innovation Lab, which is spectacular), to join us. He was raised in Bethlehem and worked at a Palestinian venture capital firm last summer, called Padico, scouting opportunities for investment. Who knows what will happen with the peace talks, but if these ten entrepreneurs are any indication, there’s hope yet for peace in the Middle East through posterity and entrepreneurship. At least that’s what I was praying for in synagogue on Saturday! With the recent bombshell announcement that Israeli Prime Minister Netanyahu has secured the release of Israeli soldier Gilad Shalit, perhaps we are a step closer. The policy conversation regarding jobs and economic development is starting to show some promising signs, particularly in helping young companies flourish. The fact that the entrepreneurial ecosystem is critical to job creation should be obvious, but there remains a misperception that small businesses create jobs. In truth, it’s not small business that represents the country’s job engine. It’s new businesses. The Kauffman Foundation’s research on this matter is clear: from 1997 to 2005, job growth in the US was driven entirely by start-ups. What this means is that any economic development effort must be framed in the context of the following central question: how can the government help more young companies be formed, grow faster and achieve long-term success? One of the most valuable resource for American start-ups are immigrants who come to the US to pursue entrepreneurial careers. Such household names as Google, Intel and eBay were started by at least one immigrant founder. Yet, we make it very difficult for immigrant entrepreneurs to pursue their dreams and build their companies in America. To address this, Senators Kerry and Lugar proposed a Start Up Visa in March 2011, providing “Entrepreneur’s visas” for immigrant entrepreneurs. This bill needs to be passed immediately (it is in the midst of hearings and keeps getting caught up in partisan bickering over broader immigration reform) and should be expanded to provide green cards for those with degrees in science, technology, engineering and math. For more on this important bill, read here and here. The administration has proposed additional changes to process immigrants in a more streamlined fashion, including a recent set of policies that the US Citizens and Immigration Services department has advocated which can be found here. But to really jumpstart company formation, the government should consider meaningfully increasing NIH funding – perhaps 2-3x its current level. Most medical research labs around the company are dependent on NIH funding and it is one of the highest leverage investment we can make – supporting 325,000 researchers at over 3,000 universities around the country. Yet, NIH funding is at a ridiculously low $31 billion per year, roughly the same in constant dollars as it was ten years ago. We spend $21 billion on tax breaks to the oil and gas industry and tens of billions of dollars on farm subsidies. This anemic NIH funding level remains despite the well-known fact that the impact on health care costs and job creation is enormous. In diabetes alone, the total government support for research is a mere $1 billion in contrast to the $200 billion per year that diabetes costs the economy. In addition to the clinical impact, each dollar of NIH funding generates more than twice as much in state economic output, not including the jobs generated by the companies who are spun out of NIH funding. I'm shocked that there isn't more discussion about channeling more dollars towards this inmportant institution. Access to human capital is another critical component to allowing young companies to grow faster. The dearth of trained computer science and engineering is crippling the growth of many Innovation Economy companies. Worker training efforts in combination with educational efforts, such as the emphasis on STEM (Science Technology, Engineering and Mathematics) is a start, but are woefully underfunded and under-supported. For example, Congress nearly cut the $181m Department of Education’s Math and Science Partnership Program and the NSF’s programs in this area also do not get enough attention. In thinking through our investment choices, we should keep asking ourselves, if they had a massive shortage of software engineers, What Would China Do? The President’s Jobs Bill contains some good ideas in this area, such as a “Bridge to Work” program, which could have a big impact when the details are fully worked through.